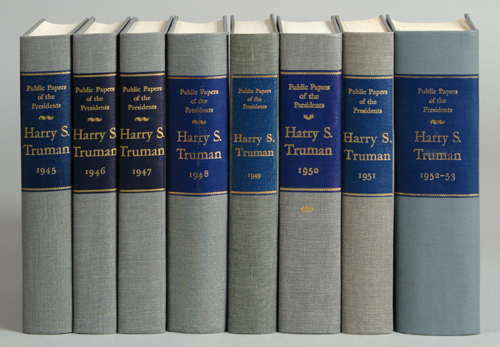 Public Papers of the Presidents of the United States: Harry S. Truman: Containing the Public Messages, Speeches, and Statements of the President. United States Government Printing Office, 1961-1966. First editions, 1966. Excellent condition 8-volume set bound in original gray boards with navy blue backdrop on spine and gilt lettering. Covers administration years 1945-1953. OUT OF PRINT.